O n August 14, 2018, the CACP, in partnership with the RCMP and the Canadian Police Knowledge Network (CPKN), announced the launch of the new cannabis online training module for police officers across Canada. This training program was developed to prepare officers to appropriately and effectively enforce the legislation legalizing marijuana, which comes into effect on October 17, 2018. This new training aligns with ongoing efforts to build provincial- territorial capacity and resources to enforce the new cannabis and drug-impaired driving offences. The government recognized, as it moved towards implementation of the new Cannabis Act (Bill C-45), that training of officers on the content and enforcement of the new Act was needed to give communities, police organizations and police officers the confidence that officers have the knowledge, tools and skills to properly enforce this new legislation. Multi-stakeholder consultations were conducted to identify the efforts that were required to deal with training for drug-impaired driving. Developing a standardized cannabis and drug-impaired driver training for Canadian policing presented an opportunity not only to provide education for officers, but to reduce risk, incorporate training into the legal framework and permit national evaluation of the training program and content. A larger group of subject matter experts, including representatives from Health Canada, the Department of Justice, government partner agencies, legal counsels, public prosecution and CACP law amendments, drug advisory, traffic safety, and Policing with First Nations, Métis and Inuit Peoples committees had the opportunity to review and comment on the proposed course content. This 2-hour, interactive, online Introduction to Cannabis Legislation course is now available to all law enforcement officers in Canada, free of charge, in both English and French. The course is designed to ensure that police officers understand the new Act, recognize criminal offences under the new laws and understand enforcement options available to them for each offence. The course incorporates visuals, scenarios, knowledge checks and a final exam, and is accompanied by complementary job aids that can be downloaded or printed. Evaluation via survey will identify further gaps in training. At the conclusion of the course, officers will be able to: • identify cannabis in its various forms and relate it to legal quantities, • differentiate between the medical and recreational cannabis regimes, • recognize criminal offences under the Cannabis Act, • articulate the elements and powers of arrest for each offence under the Cannabis Act, • identify safety hazards as they relate to environments involving cannabis, • understand how the new Act will impact policing in Indigenous communities on reserve, • make appropriate linkages to other training related to drug-impaired driving, and • apply strategies to assist with critical thinking through unknown or new situations. This course alone will not meet all cannabis training related needs. It specifically focuses on the federal legislation. Complementary training programs must be developed to address provincial and municipal laws and regulations that have yet to be articulated in many parts of the country. Additional training will also be required on the appropriate use of any approved oral fluid drug screening devices. To complement the new Introduction to Cannabis Legislation online training module and the existing classroom Standard Field Sobriety Training (SFST) and Drug Recognition Expert (DRE) training, the RCMP has developed a new online course on Basic Impaired Driving Detection Techniques, as well as an SFST Review course intended for officers who have already obtained their SFST certification. All three free online training modules are housed on the CPKN website in what is being described as the "Cannabis Portal". 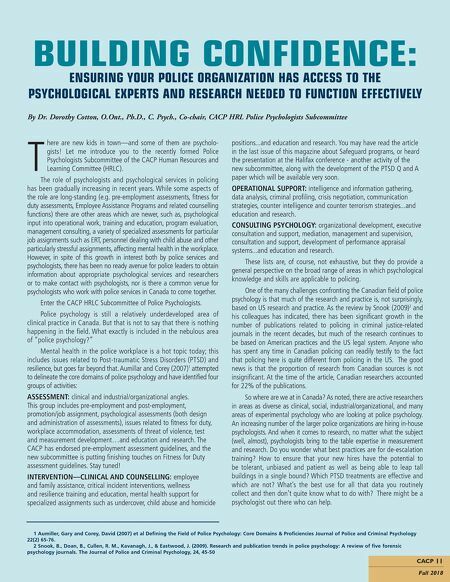 The RCMP and CPKN have committed to continue working together with Canadian policing to update this training as necessary, as new case law and amendments to legislation develop. 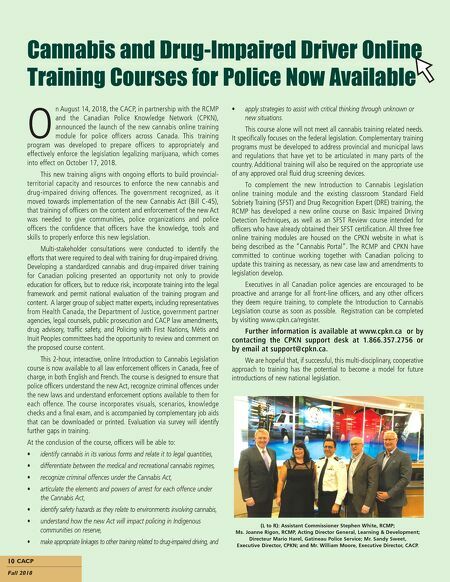 Executives in all Canadian police agencies are encouraged to be proactive and arrange for all front-line officers, and any other officers they deem require training, to complete the Introduction to Cannabis Legislation course as soon as possible. Registration can be completed by visiting www.cpkn.ca/register. Further information is available at www.cpkn.ca or by contacting the CPKN support desk at 1.866.357.2756 or by email at support@cpkn.ca. We are hopeful that, if successful, this multi-disciplinary, cooperative approach to training has the potential to become a model for future introductions of new national legislation. 10 CACP Fall 2018 Cannabis and Drug-Impaired Driver Online Training Courses for Police Now Available (L to R): Assistant Commissioner Stephen White, RCMP; Ms. Joanne Rigon, RCMP, Acting Director General, Learning & Development; Directeur Mario Harel, Gatineau Police Service; Mr. Sandy Sweet, Executive Director, CPKN; and Mr. William Moore, Executive Director, CACP.